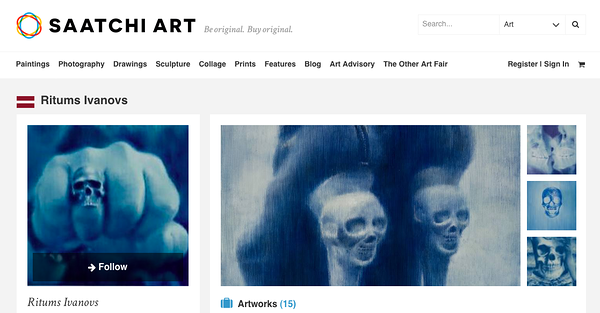 Saatchi online: "We provide artists with opportunity and art lovers with art. In 2006 the Saatchi Gallery in London, known the world over for discovering emerging talent, launched Saatchi Online as a way to give artists not represented by galleries a platform to show their work to a global audience. This simple idea attracted such a large and dedicated community of artists that the site was re-launched in 2010 with functionality that enabled artists to sell their original work as well as make their work available for print sales. Today, Saatchi Online is a place where collectors, art lovers and everyone in between can discover and buy work from artists in over 100 countries including Europe, South America, China, Russia, India, the US and other territories you might not have heard of. Our vision has always been to empower artists to have sustainable careers. We want them to do what they do best while we do what we do best.